THE CRAFT DISTILLING boom has given birth to several renowned brands in the Boston area. 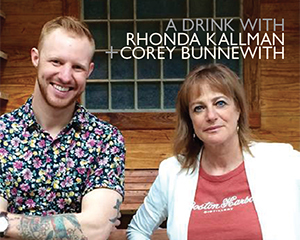 Now, Rhonda Kallman – who was a founding partner at Boston Beer Company – has her sights set on the next phase of beer: whiskey. The recent opening of Boston Harbor Distillery has been a labor of love for Kallman and its co-founder Corey Bunnewith, a fixture in the spirits and cocktail scene for years. Together, they bring not only a wealth of experience from all sides of the business, but a passion for Boston and building brands that reflect the unique history and culture of our city. I spoke with them about the challenges and opportunities in the craft world and get a glimpse behind-the-scenes of Boston’s newest distillery. BRANDY RAND Rhonda, you’ve successfully launched two breweries; what led you down the path of distillation? RHONDA KALLMAN My longtime passion for alcoholic beverages and 3O years of experience in the beer industry led me to this new adventure. Whiskey starts as beer, so Boston Harbor Distillery (BHD) is an exciting extension of my expertise. I like to think of whiskey as the grown-up version of beer. BR Corey, from working behind the bar to representing a portfolio of brands on the sales side to now operating a distillery – it’s been quite the evolution from all sides of the business! What has the undertaking been like for you? COREY BUNNEWITH It’s been remarkable! I’ve always felt that the best way to learn and to truly understand was to actually experience the business. Whether behind a bar or in the field, all that really matters is how you understand and engage with people. You need to truly be invested in adding value to your community and industry. Boston Harbor Distillery is the culmination of those thoughts and experiences to bring education and community to the front line. BR What is the story behind Boston Harbor Distillery? RK BHD is made up of a team of industry professionals with over 1OO years of combined experience, with a shared passion for spirits. It is housed in an historic pre-Civil War era brick-and-beam building located on the southernmost waterfront of Boston – the port on Boston Harbor. BHD is a community gathering place to learn, taste and get inspired about whiskey making and the art of distillation. BR Any fun facts or stories to share about the process of building your new distillery? RK Our spirit brands are named for different entrepreneurs who built their brands on the same site of our distillery starting in 1859. The federal government requires every piece of equipment involved in making spirits to have a serial number. The number on our handmade copper still, made by Vendome Copper Works in Louisville, Kentucky, is 1776; at that moment I knew that BHD was meant to be! And allegedly, Whitey Bulger and his friends frequented the area – sometimes breathing and sometimes not . . .
BR With the craft distilling space becoming more and more crowded, why do this now? How do you think you are different from other local distilleries? RK From my perspective, this is exactly the right time to be in the craft distilling space – to be on the right side of good timing as the outlook for growth trends continue. There is room for any artisan/craft offerings that are about quality, authenticity and heritage. I’m very impressed with the other local distilleries that have been at the forefront. We are a community of likeminded entrepreneurs that, together, will carve a place among the giants. BHD’s primary focus will be on grain-to-glass single malt whiskey varieties. CB I agree with Rhonda as to timing. What’s that saying? The rising tide floats all boats. The stronger we can be as a segment of the industry the better. It will always be a matter of bringing better product and stronger brand concepts to market – it’s necessary for the craft space to survive. Where we thrive is being able to offer an experience – something people can remember and evangelize. That is the catalyst behind our brands as a regional concept. BR Tell me about your current and planned product offerings. RK Our flagship is Putnam New England Whiskey, a single malt whiskey made with malted barley. Another signature is Lawley’s New England Spirit – fermented from molasses and local maple syrup – offered in aged and un-aged varieties. Seymour’s Coffee Liqueur is made from whiskey, locally roasted coffee and maple syrup. Seasonally, we will be offering limited edition whiskey distilled from finished Sam Adams beer varieties then aged in 53-gallon barrels. We call it “a true Bostonian handshake” that highlights the special connection between BHD and Boston Beer Company. Our award-winning Master Distiller John Couchot is at the helm of our products and has over a decade of experience being at the forefront of the craft distilling movement. CB Putnam is truly our stake-in-the-ground, we have a quote by Robert Frost on the bottle that says “Freedom Favors the Bold” – I think this epitomizes our mind set and direction. Being able to champion the category of New American Single Malts, specifically for the New England region, is very important to us. Lawley’s New England Spirit is our “New Coastal Standard”, inspired by the heritage of rum production in the region tied with the long standing production of maple syrup – a unique twist on a spirit, but still understandable. The white version makes a stellar daiquiri or Collins and the dark version can be spun into Old Fashioneds or a real great dark and stormy with Spindrift ginger beer and some bitters. BR What are you most proud of so far? RK After over three years of planning, raising capital, building the team, building the brand concepts and recipes, navigating the cumbersome regulatory systems, and improving a historic building, we are ready to launch! CB I couldn’t be more proud of the team. The amount I’ve learned is inspiring and to see it actually culminate into something tangible is just remarkable. We are doing this to build another icon that Boston can be proud of . . . it’s hard to crystalize that feeling. BR Do you source any of your ingredients locally? RK Yes. Maple syrup from Ackerman in Vermont and local-roasted coffee from Great Barrington Roasters as a start. We are working with some growers to make different varieties of barley and rye. BR What is the most important thing you’ve learned in order to be successful in this industry? RK Well, there are so many! It really comes down to making something that people want, even if they didn’t know they wanted it at first. CB Persistency. It’s a long road – if you keep your head down, your mind open and your heart full, you will get there. BR Both of you have built your careers in the Boston area; how have you seen the beverage alcohol landscape change and grow over the years? RK When I started in early 198Os there was literally zero craft culture in beverage. The chef-owned and operated restaurants led the way for consumers to seek out more interesting, local and quality products. Now, a “bar chef” is a norm for establishments who give accessibility, credibility and truly make drinking interesting and even more fun! CB I launched Inspired Beverage five years ago as a management company for the small boutique brands that needed a voice. Over those last five years, to see the change in the landscape of craft spirits, menus, how bar programs and retail shelves operate . . . it’s been insane. People want authenticity, they want a story, and if you can do that right and do it for a reason, you can be successful. RK Boston is famous for being a drinking town. Pre-Prohibition, there were more distilleries in the area than there were breweries. I’d love to have been part of that scene then, though thrilled to be part of the renewed energy towards distilled spirit making happening now. CB All the entrepreneurs who built businesses in our building. If I could sit at a bar with Silas Putmam, George Lawley and the guy who owned the ice cream warehouse, I think it’d be really entertaining. BR Where do you see the future of craft distilling going? RK I see it paralleling independent wineries and craft beer breweries. There will be lots of selection, variety and choice for the interested drinker. CB Regionally, it’s almost there now, but more so over the next five years. People are going to demand and they are going to rally behind their regional producers. As long as the producers can make good booze and brands that the community can be proud of, it’s going to make a difference. BR What excites you most about this business? RK For me, it’s always been a lifestyle. So to pair what I enjoy most with how I make a living is nirvana. CB Liquor is this universally understood concept: it defies language and cultural barriers. For us to be a part of that catalyst and movement, specific to the city of Boston, that’s the stuff that transcends generations if you do it right. BR What are the biggest challenges out there at retail and on-premise with regard to growing a craft brand? RK Too numerous to count, though the key is creating brands that are relevant and desired, not just be another bottle on the shelf. Availability and visibility for the brands are key, though it’s a lot easier to say it than to actually make it happen. CB It’s always going to be a fight for space. You need to build a brand that has an organic pull to it. You can’t just be pushing your weight around and expecting placements and depletions in return. I feel if you do it with integrity and focus on building a brand and product of value that that is what matters and wins in the long run. BR Favorite Boston place(s) to go have a cocktail? RK Toughest question yet; there are too many to count! Though I must say I love the Rowes Wharf Bar at Boston Harbor Hotel. Now if I could just get a boat to take me back and forth from the distillery to there . . . Actually, soon BHD will have a pouring permit and I’ll be able to have a cocktail right at the distillery (how convenient!). CB Brick & Mortar and Deep Ellum. It’s really proximity based for me. It’s amazing that the standard for a good drink has been raised so high that you can truly find a good drink in any neighborhood in Boston, whether it be Ester or Steel and Rye (right around the corner from the BHD) to the Armsby Abby and The Citizen in Worcester. The movement is real.